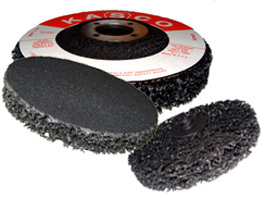 These coarse synthetic fiber discs are impregnated with abrasive grit. They are a safer alternative to wire bristle brushes. Use to remove surface material without damaging the under-surface. They are ideal for paint removal, cleaning rust, freshening old wood, and cleaning boat holes. They are available in three different configurations.